I'm a huge believer in the power of a good folktale. Folktales communicate important life lessons with only a little bit of text. Folktales are great for teaching metacognitive strategies like inferring. The repetitive structures and language support kids who are just starting down the reading road. 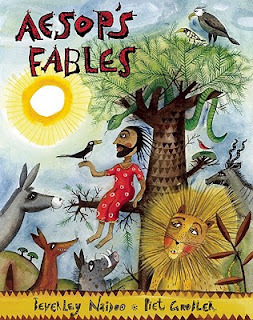 Maybe most importantly, folktales build children's sense of story. And that sense of story strongly impacts children's ability to write well, especially when it comes to personal narrative, memoir, and fiction. I think it's important then, to expose kids to lots of these short, strong, texts that can embed in their hearts, brains, and tongues. And so I read aloud tons of fairy tales, myths and legends, and trickster tales. 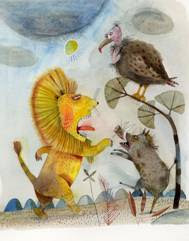 Naidoo's fables are enhanced by Piet Grobler's absolutely gorgeous watercolor, (I think), illustrations. This one is a must have for your folktale basket! 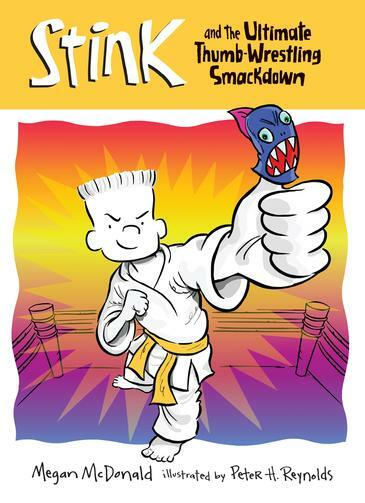 STINK is a series I love. The books are funny enough, and gross enough, that they grab the attention of my less engaged readers right away. The books are chapter books, but the chapters are short, and fairly easy, and there are comic/graphic novel inserts between each chapter, so kids who are not great readers can get through one in a few days. And there are six books in the series (and several more in the STINK AND JUDY MOODY series), so when I get a kid going on this series, I don't have to worry about that reader for a week or two. And now children's poet Kalli Dakos has written an entire book of bathroom poems! we'll have a chance to talk…"
I'm trapped in the bathroom. with a door that is stuck…"
"There Should be a Place Kids Can Go"
I think these are all poems that kids are going to love! Can't wait to share them with my fourth graders at our Poetry Friday meeting this morning. Poetry Friday is at Anastasia Suen's Picture Book of the Day. I adore pretty much anything Loren Long writes and/or illustrates- MR PEABODY'S APPLES and OF THEE I SING are two of my favorites. I also love OTIS, partly, I think, because it reminds me of MIKE MULLIGAN'S STEAM SHOVEL, a book I absolutely loved as a child. Today I was at the bookstore investing another chunk of my life's savings in series chapter books for my fourth grade classroom. Wandered over to the picture book section and found Loren Long's newest book, OTIS AND THE TORNADO. Otis and his friends are enjoying a day on the farm, when the weather changes. The humans heads for shelter in an underground tornado shelter, and Otis bravely breaks open the barns and corrals and leads all of the animals to safety at the lowest point on the farm. They have no sooner gotten settled when Otis hears a cry of fear. It is from the Bull, the meanest, unfriendliest animal on the farm, who is still trapped in his pen. Should Otis risk his life to go back and free the most feared animal on the farm? A great story about risk taking and courage and friendship! It is Monday morning, and Marvin McGregor is eagerly anticipating seeing his teacher's pet tarantula. When he arrives at school, however, he discovers that the teacher has broken his arm and will be out sick for a few days. The substitute, Ms. Payne, gives lots and lots of homework. Marvin has the best of intentions, but he keeps having homework mishaps. 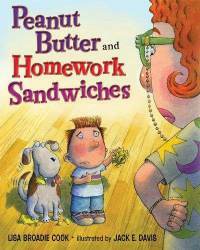 On Monday, he spills peanut butter on his homework and the dog eats it. On Tuesday, he accidentally leaves it in his pocket, and his mother washes it. Another day, he exchanges backpacks with his little sister, and takes her doll to school. Shared this, along with the poem, "Homework, Oh Homework" today. The fourth graders loved it! OK, so I'm trying to get back into blogging again, but alongside a full time job, and single mom, not to mention football board member (my second full time job every Fall!) it's a teeny bit much. This, then, will be another one of those mini-reviews. 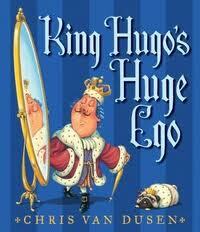 KING HUGO is a king who thinks very highly of himself. One day, on a foray of his kingdom, his path is blocked by Tessa, a villager, carrying a heavy load. Not knowing she is actually a sorceress, he orders her to move aside. She responds by placing a spell on him, so that every time he thinks/speaks about himself his head grows a little. Before long, his head is so large that he can't get through doorways, or stand on his balcony to give his weekly "Speech of Adoration." This book has a fairy/cautionary tale kind of feel. It's told in rhyme, which I usually don't love, but this one is terrific. I loved it, as did my fourth graders! Student: When I get old, I am going to have a men's club. Me (stopping mid-sand pouring, a little startled): You are? Student: Yes. We are going to drink Coca Cola and then go to bed. And that's all. As the very tired mother of two teenagers who came home after their football game, and then went out again to visit their adoring fans (girls), I think this sounds terrific. I hope my boys join soon! It's been over a month since I last blogged. I've returned to the classroom after more than a decade of literacy coaching, administration, etc. and life is more than a little overwhelming. Finally decided I am going to write a few quick sentences and that will have to be enough. This weekend I was out shopping for more BABYMOUSE books. Found those, but also found WHITE WATER, which I have added to my Civil Rights basket. The book is based on author Michael S. Bandy's experiences growing up in the South during the Jim Crow era. One hot day, he and his grandmother ride the bus to town. When they get there, Michael is thirsty, and takes a drink from the public fountain. The water is brown and warm and nasty, and Michael takes only a quick drink. 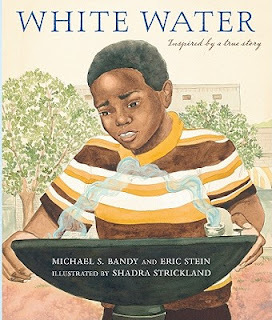 When the white child next to him takes a much longer drink from the "Whites Only" fountain, Michael is sure that it's because the water in that fountain is much colder and better tasting. He becomes obsessed with taking a drink out of the whites only fountain. I'm planning on reading this book in a string with SISTER ANNE'S HANDS and SIT IN.